Reporting is a very important part of product lifecycle management. Actually, without reporting it is hard to imaging how you can make all information about a product and its lifecycle usable. At the same time, PLM vendors ditched reporting capabilities for a very long time. I was writing about it few times. Maybe you can take a look on one of my posts almost two year ago – Do we need reporting standards in PLM?. Many years reporting was the add-on function, and the niche was mostly occupied by service providers and implementers. Recently, I noted a trend that made me change my opinion. I can see some significant changes in an attitude CAD and PLM vendors put to improve some reporting capabilities. One of the elements of this trend is “visual reporting”. Enhancements to NX 8 in the area of product design include more powerful and efficient modeling, drafting and validation solutions along with expanded HD3D support for better design decisions. 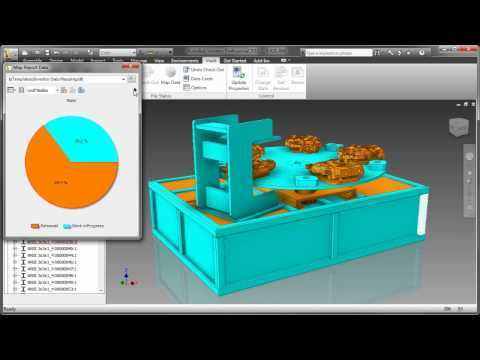 Expanded HD3D and design validation tools provide enhanced interaction, more powerful reporting and enriched visual presentation of PLM information from more sources. Standard HD3D features now provide a visually rich and more flexible feedback environment to help users quickly locate, diagnose and fix problems, ensuring designs comply with standards and fulfill requirements. High Definition 3D (HD3D) capabilities include enhancements like new simulation “results measures”, that allow users to tie results directly to requirements so teams can make smarter decisions. Al Dean of Develop3D wrote about HD3D and Visual Reporting in his article earlier today. See few screen-shots from this article. Who else is in business of Visual Reporting? Watching NX8, HD3D made me think about other vendors probably pushing towards the same directions. I found Dassault System 3DLive product (even earlier than HD3D) trying to accomplish almost the same goal of combing 3D visual information and information coming from PDM and ERP system. I think Siemens development folks definitely learned from Dassault 3D live before building HD3D (just my opinion and combination of dates). Interesting enough, I found Autodesk is also not standing aside and watching how Siemens PLM and Dassault are improving the reporting capabilities of their products. Autodesk proud to call it “Visual Data Management”.